In line switch. WARNING: This product contains a chemical known to the State of California to cause cancer or to cause birth defects or other reproductive harm. Requires two 60W bulbs. Light displays a beautiful White color. Features a classic Tiffany inspired design. Contains hand-cut pieces of stained glass. Minimal assembly required. 16 in. L x 16 in. W x 8.5 in. H (7 lbs.). 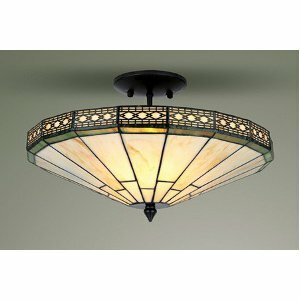 Handcrafted using the same techniques that were developed by Louis Comfort Tiffany in the early 1900s, this beautiful Tiffany style piece contains hand-cut pieces of stained glass, each wrapped in fine copper foil. 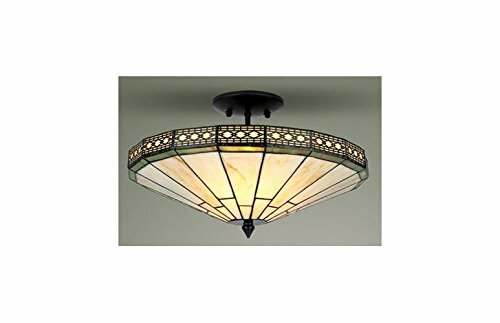 Fixture features a classic Tiffany-inspired design. Light displays a beautiful White color. Pendant will dress up any room in your home or office.